How do I add students to a class once it's already created? Once you have already created a class and added students, you may need to make changes. You can edit an existing class whenever you need to add students who are new to your class. Note: When adding a student to an existing class, all existing assignments and assessments are automatically skipped for the student. You will need to change the status of the appropriate assignments/assessments from skipped to assigned. First you'll need to find the student(s) you would like to add. The easiest way is to filter by student grade. 5) Click on the down arrow to select student grade. Place a check in the box beside the appropriate grade. 6) Once you have selected the desired fields, click Search. 7) A list of students who fit your criteria will display in the Search Results box on the left. 8) Put a check before the name of each student you want to include in this class. Note: If you want to select all students, put a check before the top box beside the words Student Found..
9) To put these students in the existing class, click the Add button. Notice that their names now appear in the Student Enrolled box on the right. 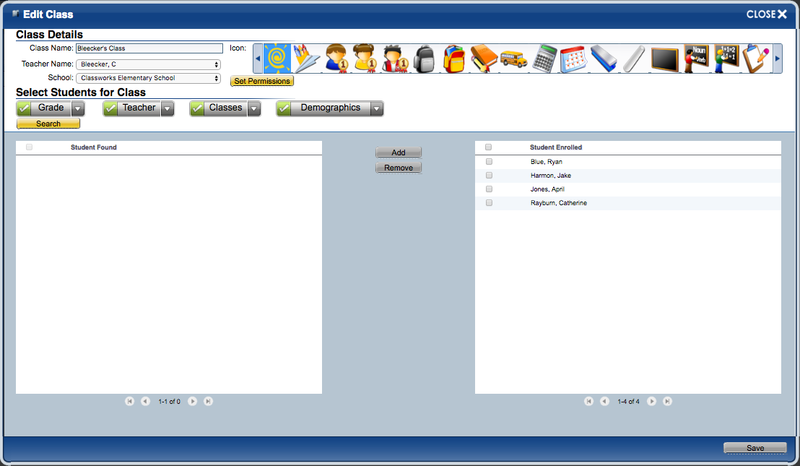 10) Once you have added students to the class, click the Save button.